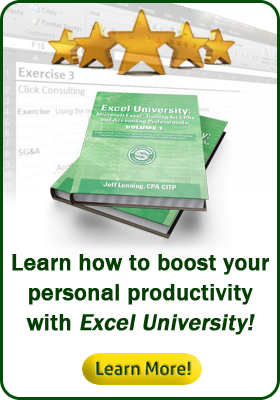 Both the Excel University Graduate Certification program (40 CPE) and the individual Excel University courses (Full Volumes 1-4, 55 CPE) lead to the same certification. Here is a quick background and comparison. The certification program and the V1-4 courses teach the same Excel topics, but, as I was planning the certification program, I decided to re-shoot all the videos and roll it out as a single course. Plus, the certification program includes the textbooks (printed or Kindle), whereas they are optionally available directly from Amazon for students taking the individual volume courses. Both ultimately lead to the certification, so, it is really just a matter of personal preference.